August 10, 2017, Taipei, Taiwan – BIOSTAR’s popularity with its price performance line of crypto mining and RACING gaming motherboards for Intel and AMD platforms have the communities taking notice; now the BIOSTAR RACING boards are gaining popularity from the modding community. Featured here are projects from a couple of top Thai modders, the ‘BR7 [THE WINNER]’ that is themed around the BIOSTAR RACING X370GT7 and BIO RACING that went with the BIOSTAR RACING Z270GT9; both mods making good use of the VIVID LED DJ, VIVID LED Armor and 5050 LED Fun Zone for RGB lighting effects. For a more sci-fi look, the BIOSTAR RACING X370GTN joins forces with the superhero from Marvel Comic in ‘I am Groot’ from one of the top modding teams in Germany. 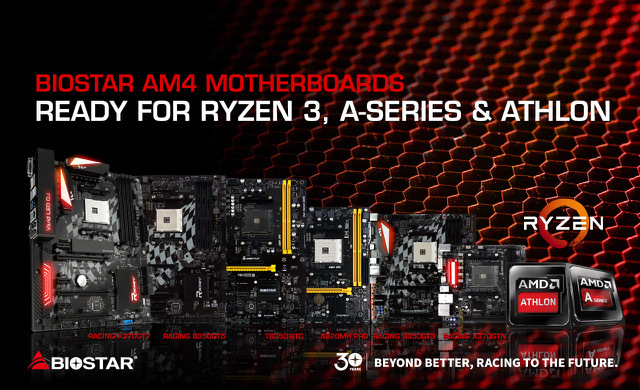 July 31, 2017, Taipei, Taiwan – BIOSTAR RACING and PRO series motherboards offer one of the widest selection of AM4 motherboards for Ryzen™ 3, 5, 7, Bristol Ridge and 7th Generation A-series. Gamers looking to take full advantage of the affordable AMD quad-core CPUs can select from BIOSTAR’s RACING X370 series: RACING X370GTN, RACING X370GT7, RACING X370GT5 or RACING X370GT3. While anyone aiming to build a value and performance system can select from BIOSTAR’s RACING B350 series: RACING B350GTN, RACING B350GT5, RACING B350GT3 and RACING B350ET2 and PRO B350 and A320 series: TB350-BTC, TA320-BTC, A320MH PRO and A320MD PRO. 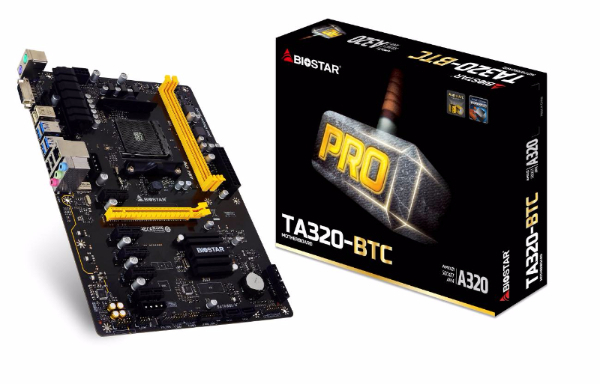 July 10, 2017, Taipei, Taiwan – BIOSTAR proudly announces the BIOSTAR TA320-BTC, a versatile mainstream motherboard that not only is a great price performance crypto mining platform, but also well suited for essential computing needs with media playback functions. With a low-entry price point, the TA320-BTC should top anyone’s list when considering entering mining craze, especially with its scalability of up to 6 graphics cards. June 8th, 2017 Taipei, Taiwan – BIOSTAR is proud to announce the perfect solution for those looking for the most cost-effective solution for their gaming and crypto mining platforms, both new and old gamers and miners alike. 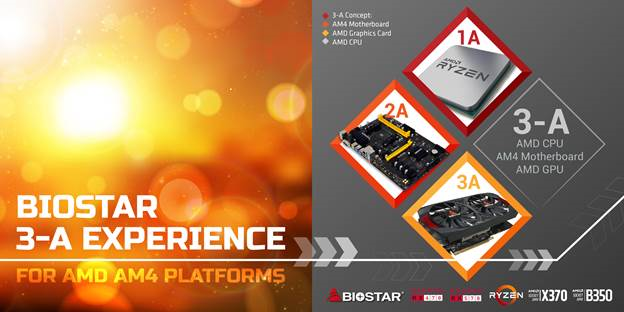 BIOSTAR’s new 3-A Concept utilises the combined foundation of AMD’s product platform including the AMD RYZEN 7 and AMD RYZEN 5 CPU, together with AMD chipset motherboards and AMD graphics cards. 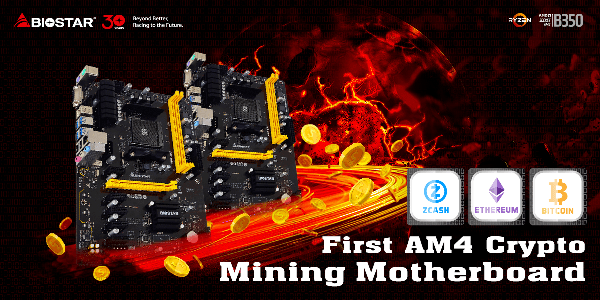 This allows a complete AMD-based ecosystem that is designed to work together in complete harmony to give miners, enthusiasts and gamers the best combination of utmost efficiency and performance. May 8th, 2017 Taipei, Taiwan – BIOSTAR is thrilled to welcome the latest addition to its expanding lineup of specialised cryptocurrency mining motherboard with the introduction of the BIOSTAR TB350-BTC. This motherboard supports AMD’s latest AM4 socket designed to work with the latest AMD AM4 APUs. With Bitcoin mining retaking a more attractive pricing lately, both old and new miners are still seeking ways to improve the efficiency and performance of their mining systems. Add to this the addition of other cryptocurrencies like Ethereum, Zcash and more which have provided so much more for the mining community to work with. With new GPUs offering more efficiency than the previous generation, more GPUs can now be utilised for faster ROI. This trend in utilising multiple VGA cards can cause extremely hot operating conditions which may affect system stability which may lead to operation disruption with breakdowns and failures. March 30th, 2017, Taipei, Taiwan – BIOSTAR is proud to share its unwavering dedication as a dependable brand as it tours around Asia, bolstering its presence and showing partners, dealers and customers alike that BIOSTAR the wide range of products and solutions in its growing portfolio. BIOSTAR recently concluded a string of launch events across Asia in countries including Thailand, South Korea and China. BIOSTAR showed off its latest RACING products for both AMD and Intel platforms as well as its new storage solutions partnering with key partners to show-off the excellent feature set and offerings of BIOSTAR products.